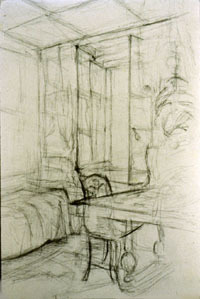 Organizational lines also relate foreground subjects to background information and so help in the arrangement of visual information in the picture plane.� These lines are used to take measurement of height, width, and depth of the subject(s) and the space occupied.� Like gesture lines, they are stated multiple times as the artist establishes the correct proportions in the drawing. Using a loose grip on the drawing tool and relatively light continuous pressure, the shoulder and elbow are used in drawing the essential vertical and horizontal elements of the subject.� The subject being drawn is constantly referenced as the drawing develops. �No lines are erased, rather they are built upon as changes are made during the course of the drawing. Some General Guidelines for Organizational Line Drawing. 1.� Begin with vertical and horizontal lines that are both actual and implied; add diagonal lines last. 2.� Establish heights and widths of all objects as well as background shapes. 3.� Allow lengths of line to cross objects in order to establish a means of measurement between them. 4.� Extend lines that are related to an object into the negative space. 5.� Check on proportions by comparing the relative height and width of the objects and their structural elements as defined by your initial exploration of boundaries and interior information. 6.� Make corrections based on analysis of your drawing and observation of the subject.� Use relatively darker lines to establish which proportions are correct. 7.� You can direct the viewer's eyes through the drawing by means of darker lines and more fully defined shapes.� Do not erase.� Do not shade in the shapes developed. Organizational line can be understood as a means of providing a working framework for a drawing and it can be compared with how scaffolding is used in the construction of a building.� Vertical and horizontal lines are initially stressed and the form is built from its foundations up. Organizational lines are used to take measurement of the object, its parts and surroundings.� These lines extend into space and like gesture and continuous line drawings, they are not confined by the edges of an object.� They call upon the artist to explore the obvious boundaries of the subject as well as to uncover its subtle surface characteristics that suggest structure. �Unbroken line cross from boundary line to boundary line of an object and often across lines that define one object versus another.